His reputation precedes him: The long-time Belarusian leader Aleksandr Lukashenko has been often referred to in the Western media as ‘Europe’s last dictator’. But he insists he doesn’t have the means to be one as RT sits down with the President. “In order to be a dictator and dictate one’s will one has to have the resources: economic, social, military, population, and so on. But we have none. 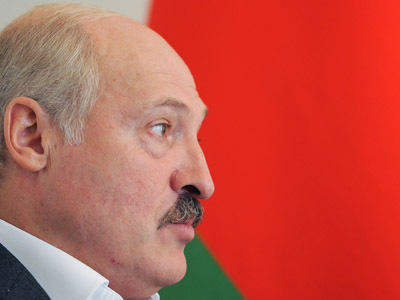 And I am being objective about it,” Belarusian president told RT’s Sofiko Shevardnadze. The 58-year-old former head of a state-owned farm told RT he has no intention to hand over power to any of his sons. “I swore I would never delegate the reins of power to any of my relatives, loved ones or children. 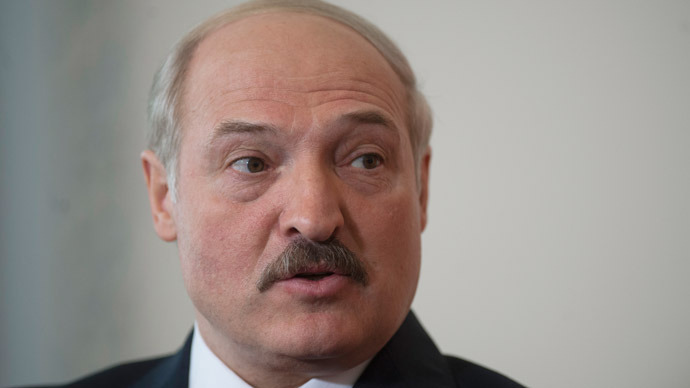 It’s out of the question,” Belarusian leader emphasized. “Who wins a fair election will have the power. Like I did when I won the race as a candidate from the opposition,” he added. The Belarus leadership has repeatedly been the target of fierce criticism from the EU over its crackdown on the opposition and lack of respect for democracy and human rights. Up to 250 Belarusian officials, including President Aleksandr Lukashenko, and 32 companies are currently subject to travel bans and asset freezes within the EU. For more on this as well as Lukashenko’s view on relations with Russia and international community, his presidency and successors, and the overwhelming economic crisis and Belarus’ fate read the full interview below. RT:Mr. Lukashenko, hello and thank you very much for sitting down with RT. AL: It would be a shame to refuse an interview to such a channel. RT:You are very kind, thank you. You’ve come to St. Petersburg to discuss further integration of Russia and Belarus with President Putin. You know, earlier there was talk of a single currency, a single flag, a single parliament. But now, less than twenty years on, it’s kind of obvious that it is most unlikely to happen. Why have these large-scale plans fallen through? What is tearing our countries apart? AL: You are absolutely right, except for one thing – that it will never happen. Why? 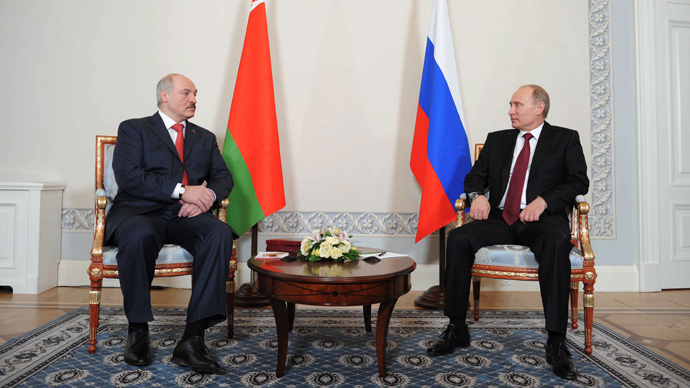 Historically, Belarus was the only post-Soviet republic that sought to build stronger ties with Russia. That’s why together with the then-president of Russia, Boris Yeltsin, we signed a treaty aimed at bolstering our cooperation and fostering integration. As we moved along this path, we realized we needed a new legal framework to bring our countries ever closer. So we came up with a treaty that saw the creation of the Union State of Belarus and Russia. That’s how we called our single state and there’s still a chance that our plans will come to fruition. The current president, Vladimir Putin, was among those who helped to draft this treaty. Signed by Yeltsin, the document was ratified by the parliament during Putin’s tenure, so we actually exchanged the documents with him. Later on, Dmitry Medvedev told me he also worked on this document when he was serving in the presidential executive office. So we have all been co-sponsors of this treaty. Now, if you actually look it up, you’ll see that it lays down a clear plan of action to build this Union State, listing all the key elements needed like the single currency and common institutions. Although it’s a very detailed blueprint, we were also supposed to draft a new constitution and hold a referendum on it. However, we never did this last bit – there was no constitution or a referendum. AL: You say why? I’ve got the same question. Maybe we have the same answer. You’d better address it to someone else, not Belarus. RT:Is it because the elites don’t want to give up their power? AL: There’s a number of reasons. It was not me who stalled the referendum. I worked hard on this treaty, I signed it, I am the only one of the original sponsors who is alive – Boris Yeltsin has left us, unfortunately. There was no way I could have stalled the process. But apparently there are some forces, in Belarus, too, but mainly in Russia, that strongly opposed these plans. Now, talking of a single currency. Initially, we planned to come up with a single currency unit that would be supranational, that is neither the Belarussian, nor the Russian rouble. It should have been a currency along the likes of the euro. What’s more, we could have adopted it earlier than the EU. But we were told it would be the Russian rouble, and the printing press would be in Russia, too. Back in Belarus, this proposal was regarded as a surrender of sovereignty and independence – and not without reason. How can you have a state without a currency? RT:Did you want to have it in Belarus? AL: No, this proposal was never on the table. Of course, if you are to build any union, the main principle is equality. If the parties do not enjoy the same rights, such a union is not viable. It’s as clear as day, and that was the underlying principle we originally proceeded from. So when our partners began to focus on single issues only, like the currency, we came out and said that you can't build a house from the roof up. We proposed to act step by step in line with the plan set forth in the treaty we ratified. Unfortunately, we have not been able to remove these obstacles, and that’s why on some of the issues we weren’t able to move forward. Then we had a talk with President Putin and decided to try and make some headway on the issues we can. And in this way, we have managed to accomplish quite a lot in terms of the creation of the Union State. You might have heard that during our joint press conference Vladimir Putin, probably for the first time, referred to our integration efforts as a significant pilot project. RT:What do you mean by a single budget? What is it for? AL: The funds are invested in 38 joint projects. These are mainly innovative projects involving cutting edge technologies. We support this R&D activity and help some of the projects financially and then hand them over to the business community or create a common property as part of the Union State. So the money is not just spent on the small executive office of the Union State and these kind of events. The annual budget worth 5 billion roubles is channeled into 38 projects in agriculture, industry, culture, education, healthcare and other areas. Thanks to that, we have made significant headway over the past years, although we have not been able to deliver on what was spelt out in the treaty. We have come to realize that perhaps we are not ready for it yet, that it’s not the time. There are both subjective and objective reasons behind this. But there is still one great upside – our joint efforts towards a Union State led to the creation of a new organization – the Customs Union, which, in its turn, brought about a Common Economic Space and we are now working to transform it into the Eurasian Economic Union. RT:Would you agree with those analysts who say that it’s an attempt to restore a mini-version of the Soviet Union? AL: It’s a matter of taste. Some compare it to a mini-Soviet Union, others compare it to the European Union. You can perceive it any way you like – we don’t shape the narrative here. Let them say what they want. Our job is to move forward. One indicator of our success is the turnover figures we have achieved over the past two years since the creation of the Customs Union. Our bilateral turnover has reached $45 billion, marking a 16 percent jump. Just fancy that! An increase of 16 percent over two years is an enormous accomplishment. Mind you, it has not been only down to energy supplies from Russia. We have seen our imports and exports grow in the same proportion. So our joint work on the integration track has given a great push to mutual trade and helped to develop the economies of both Russia and Belarus. And Kazakhstan has benefited greatly, too. Last year saw a 38 percent increase in the turnover within the Commonwealth of Independent States. This has allowed our economies to stay afloat during these turbulent years of the world financial crisis. That’s proved to be a great benefit for us. As for similarities, you can, of course, compare it to the Soviet Union or the European Union, or any other union. But regardless of which one exactly you pick as a reference point, we can spot the trend – the world is seeing a global integration process, with new unions emerging across the planet. Take APEC, for example, or MERCOSUR in Latin America. I just returned from Venezuela. There are many more examples of this trend. New organizations emerge to survive in this competitive environment. Why shouldn’t we use the positive experience of the Soviet Union in fostering our relationship? AL: No, it’s not about the past. We will not be able to restore the Soviet Union, which, in my opinion, is very unfortunate. We cannot bring it back to life but we should use the best of its experience. It can help new, independent states cooperate more effectively, to survive through difficult times and create more material wealth for their people. There’s nothing bad about it. RT:Now, if we look beyond Russia, you were very close to Hugo Chavez. He was a figure who united a group of world leaders in challenging the West and Western corporations. Now that he is gone, what is the future of this alternative movement? AL: That’s the perspective of the media, and maybe you are right in your own way. Indeed, his policy featured some of the elements which you just described. But I would not say that Chavez united us simply because it’s so difficult to do. I first realized that when we became part of the Non-Aligned Movement. There are so many forces, including the United States, trying to win these non-aligned countries over to their side, to drive a wedge into the movement. Hugo Chavez worked hard to unite developing states. His contribution was really great, and I was lucky to have worked with him on this track. However, we have not been able to overcome these centrifugal forces, even in the Non-Aligned Movement, due to various reasons. So I would not overestimate our efforts and say that we, and Hugo Chavez in particular, made huge progress in that area. Nevertheless, he shook up Latin America – almost all the leaders there are left-wing, and they all came to pay their last respects to Chavez. This is a very clear proof of his legacy. He is gone but he set it going. Latin America now boasts unique and strong leaders. Take Ecuador’s Rafael Correa, for example. He is an economist, an intellectual, a very powerful personality. Take the women presidents – in Brazil and Argentina. They are quite active, too. I won’t go as far as to say that this process has become irreversible, but it will impact the whole world as well Latin America. You can’t just ignore it. Similar trends can be now observed in Africa, Asia and other regions. Of course, the contribution of Chavez was significant, but you shouldn’t overestimate it. What I mean is that this movement for freedom, independence and justice will not wind down now that he is gone. No way. But of course, his role was essential. RT:If we take Venezuela, Chavez was not the only popular figure – there are one or two key opposition figures well-known to the world. 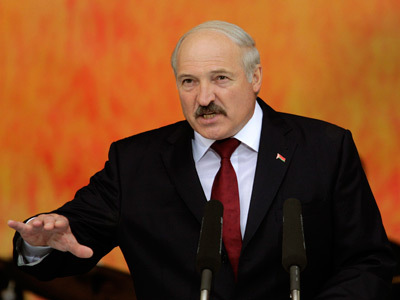 But if we take Belarus, it’s only Lukashenko who’s in the spotlight. Sooner or later, you’ll have to hand over the power to somebody else? How will that happen? AL: To be honest, I never think in these terms. I swore that I will never hand over power to my relatives, to my in-laws or children. It’s out of the question. But the bottom line is that you need to win a fair election to get power. I remember that I won my first poll as an opposition candidate. It was a fair win, just like all the following elections where I won. Of course, I was criticized, they said that Lukashenko is a dictator and he rigged the vote. Only a blind man can say that. Bi-partisan analysts will never say that Lukashenko won thanks to fraud. I have always played by the rules and I want people who come to power after me to do the same – to win an election in a fair way. If this were not true, the Belarusian people would have never agreed to tolerate Lukashenko as president. It’s a nation of intellectuals, well-educated, talented and smart people. Who will take over the president’s job: Lukashenko’s sons? RT:So you are not grooming anyone as your successor? AL: No. To be honest, I have decided for myself that I will not even support anyone publicly. It must be conducted in a fair way. The people should elect their leader themselves, when they are ready for it. RT:I remember that during your summit visit to Venezuela, when Chavez was still alive, he said, ‘we have a great holiday today – our guests are President Lukashenko and his son’. And you told him he was right in mentioning the boy because ‘we need someone who will continue our cause, someone we can pass the baton to 20-25 years from now’. AL: I didn’t say ‘pass the baton’, I said ‘carry on our cause’. I do remember it very well, and I said it in a very responsible way. When I say ‘carry on’, it doesn’t mean he would just take the helm and get into the president’s chair. We have a million boys like Lukashenko junior, and it’s them who will continue the cause which Lukashenko began some time ago. They will continue the work that I have been doing. Now here’s what’s on my record. 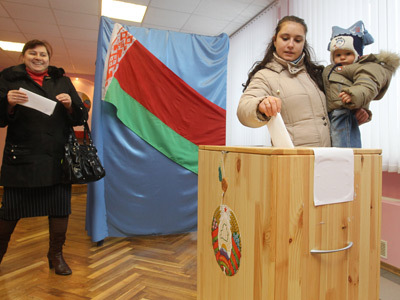 Belarus has become a sovereign and an independent state. For the first time in our history, Belarus has retained its independence for two decades – this is the biggest accomplishment of the work done by my cabinet and me. We have created all the attributes of a state, except for a border with Russia. But we don’t need it for the time being. Russia doesn’t lay claim to our lands. We don’t see it as a problem. Apart from that, all the major institutions and components that make a state a state are there. This is a great achievement, isn’t it? We have the state of Belarus built with our own hands. Many generations have grown up since, and more will grow up, young people like Lukashenko junior will grow up. So there will be people, who will continue our cause. Frankly, I didn’t mean my son. He must be 35 to even qualify as a presidential candidate. So if you look 30 years from now, I’d be almost 90. I won’t live that long. AL: That’s what I think. Even if I do live that long, I won’t be president at that age. RT:But if Nikolay wants to make a career in politics, will you support his choice? AL: He is free to choose his profession. But I wouldn’t like him to become a politician. He is eight now, and he’s seen enough of his father’s presidency. He’s never had this idea that he will be president because his father was president. I never bring up this issue at home. That’s not a topic to discuss with children. As for my grown-up sons, they are pretty straight-forward about it. ‘We’ve had enough of your presidency’, they tell me. So we never talk of a power handover with them. And, generally, I never talk about it anywhere else. Why should I? I’m still alive and kicking, so I think I can carry on for some time. RT:That’s why I didn’t mean ‘now’, but sometime in the future. AL: No. I never talk about it and I am not grooming any successors. The people should choose their leader themselves, and it should be a competitive struggle. RT:Correct me if I am wrong – I have here a quote of yours. You said, ‘I am horrified at the thought that the Belarusian wealth that I have toiled so hard to create and preserve would be auctioned off’. Did you mean Belarusian assets would be sold off when you are gone? AL: Yes, that’s something I am afraid of. RT:How does it happen that the system you’ve set up is so fragile that it will collapse immediately after you’ve gone? AL: I didn’t mean that Belarus would collapse as a state and would shrink to its capital, Minsk. I didn’t mean that. What I meant was state property, the enterprises that underpin the economy, agriculture, which we have upgraded. Take agriculture, for example. Last year, we exported $5 billion worth of produce like meat and dairy products. $5 billion is a hefty sum. And you have to go back to the time when I first became president. It was a time when we couldn’t feed our own people, we had empty shelves, and there was no food on the table, as I say. Today, we have plenty of food for our people, and our prices are much lower than in Russia, Ukraine, or the EU. Today, we export $5 billion worth of produce. We have invested a lot of money into two major upgrades in agriculture. So imagine a new person comes in with a different policy. Imagine he wants to privatize agriculture or cut the current large farming companies into a lot of smaller ones. Our modern farming companies – both state-owned and private – are way larger than the Soviet collective farms. They control huge areas of land with between 9,000 and 22,000 hectares. They produce and trade in a broad range of items like meat and dairy products, bread, and pastry. So if new people in power decide to sell it off, Belarus will face disaster. That’s why I am so afraid that they will destroy our current system. I don’t want our industrial enterprises or companies working in other sectors to be auctioned off for a penny. I fear for Belarus because these economic entities lie at the foundation of any state and nation. AL: This is a sustainable system, but it doesn’t mean it will definitely collapse when I am gone. It will not happen unless the new president and parliament decide to destroy the state of Belarus. I have thought about it. I don’t want to praise myself too much but in fact, a lot depends on the leader in any state. AL: The example of your homeland and other countries just proves my point. That’s why I am very much concerned about who will be in charge of it next. Many journalists visiting Belarus tell me it’s a very neat and tidy place. I would like Belarus to be run by a man who will not go to extremes, but would rather continue this cause. You can fix things, there might indeed be some changes here and there but they should be gradual and evolutionary in character. It might so happen that some things will stand in the way of normal life and will need to be removed. It’s okay as long as it is in line with the will of the people and the way of life which will emerge at the time not only in Belarus, but in the whole world. RT:How seriously do you regard your political opponents, for example, those who also ran in the 2010 presidential election? AL: To be honest, I don’t take them seriously, and here’s why. Just ahead of the election, I made sure all these candidates were registered. I publicly admitted I did more than I should have done for that. I sincerely wanted these candidates to show to the people what they are really worth. And these elections revealed who they are… So we had 10 alternative candidates. They only scored 1.5 to 2 percent. That’s their score. Okay, they might complain they were at a disadvantage. Alright, let it be 5 percent. So how am I supposed to take them seriously if they come out and preach such nonsense that people don’t accept it? We didn’t shut them down - they preached their ideas on air. Even when they violated the constitution and called on everyone to take hayforks and crush the regime, only 800 people came to the central square, including 400 permanent opposition activists. That’s it. And then they really set out to crush the government building. AL: Absolutely. It’s just as good, trust me. I can prove right here, right now that there is no dictatorship in Belarus, shall I? Very simply, in just a few words. This is the argument I use to convince my Western partners. In order to be a dictator like Stalin one has to have the resources. Resources are paramount, you need to understand that. Do I have any nuclear weapons? Exactly, I don’t. Do I have as much oil as Hugo Chavez did in Venezuela? No. Do I have as much natural gas as Russia? None at all. And so on and so forth. Do I have so many people as China does, 1.5 billion people? No. In order to be a dictator and dictate one’s will one has to have the resources: economic, social, military, population, and so on. But we have none. And I am being objective about it. I am telling you that we have no claims of global importance and don’t see ourselves solving major global problems. We don’t have the resources to do so. What we want to do is find our place in the sun and live as an average civilized European state. That’s all I want. RT:Well, if it’s the way you say it is, how come no other significant political figure has appeared on the political scene in Belarus over the last 19 years? AL: That’s probably because the current leader is strong enough and you don’t see any others in his shadow. I don’t want to sound immodest. But this question is not for me to answer. Of course we have what you call the opposition. I call them the fifth column because they work for the benefit of someone other than their own country. They are nothing like Zyuganov in Russia who is the opposition but he doesn’t work against Russia or Russian people. 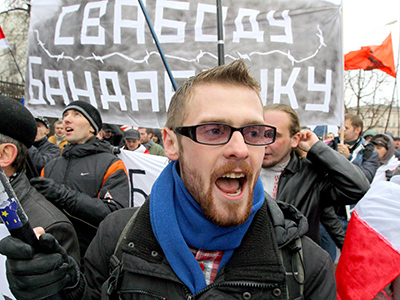 In Belarus, the opposition is the fifth column financed from the outside. And they promote the agenda of those who finance them. Is that acceptable? What kind of people would support such opposition? As for those who do want to do some good work, they work with Lukashenko. And we have enough powerful influential officials, such as the prime minister, deputy prime-minister, chief of staff, governor, and people know them. You might not know them because you don’t live in Belarus. But people here do. They work as one team with Lukashenko. We also have many talented businessmen running companies. But there is also the opposition, the so-called fifth column. It’s called that because of the things they do. They act like one. And people know that, too. But you shouldn’t worry, the time will come and we’ll have new leaders. No one knew Lukashenko many years ago. Well maybe someone heard of an active deputy who was the head of the anti-corruption committee a couple years before the election, ran agricultural reform, and met Gorbachev two years prior to that. That meant something you know, they didn’t invite useless people to the Kremlin. And step by step he got into the limelight. No one expected that people would pick me over such major figures as Chairman of the Supreme Council Shushkevich, Prime Minister of Belarus Kebich who was a very bright man, and the leader of the opposition Pazniak. We ran for the Presidency all together as competing candidates. 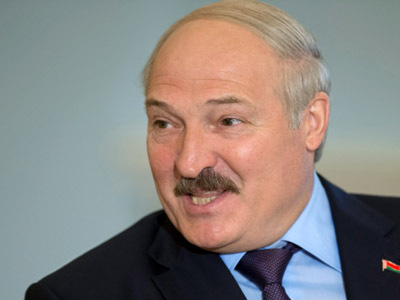 Who could know that people would vote for 38-year-old Lukashenko. No one could. But things like that happen. I still don’t know why people chose me back then and voted for me. Yet things like that are possible. AL: You can if you like, I don’t mind, though I do know them very well, that’s certainly true. RT:And so does everyone: a lack of political pluralism, freedom of speech, and so on and so forth, it’s a long list. But what I would like to ask you is why do you think you are persona non grata there? AL: You know, I visited Venezuela recently. And I had some time to think. I did some reading, analyzed things, and I thought of it as if I were debating with the Americans and the West in general. So I say, all right, Lukashenko is persona non grata for you, and you deny him entry. But you also deny entry to both my elder sons and to even my youngest who is just a little boy. What wrong could he have possibly done? Does he have anything to do with the alleged rigging of elections? All of my children are completely excluded from the election process. How can they possibly just label them whatever it is they labeled them, something bad obviously, and simply ban them from the European Union? If they care about human rights, why do they abuse the human rights of my citizens? I can understand why they don’t want to put up with Lukashenko. I can tell you the reasons why they don’t. It’s not because I’m an authoritarian leader, although that may be true. And it’s not because they call me a dictator – well, they used to, no one has been calling me an authoritarian or a dictator for a while. They used to call me that because they had been instructed by the US to do so. AL: Why did they impose the entry ban on the judiciary? Judges do everything within the law. They take the law book and make decisions based on it. What wrong could they have done? And the same applies to many others. Are you asking why me? Well, you know, when the new state of Belarus appeared on the map and claimed a place in the sun – just like Georgia and other newly-formed states - those who’d already been there didn’t like it, as they wanted that place in the sun for themselves, and now they had to move over, and some were unhappy about it. But that’s not the real problem. Then it starts to go from bad to worse. Lukashenko decides to take a hard stand for the state’s independence – while everyone wants a piece of what Belarus has to offer in terms of the economy. Some want Belarusian potassium, others want this oil processing facility or that oil processing facility. Many now want our agricultural sector, and they want it cheap. But Lukashenko says “No. That’s a no go. We’re not selling anything cheap. And we decide what it is we want to sell: a share in the company or the entire company.” And they didn’t like that either. They didn’t like me taking a stand and so they started calling me all sorts of things. Next. Unlike the EU and most former Soviet states, like Georgia, Ukraine, Russia we did not choose the track of building a capitalist market-driven economy, where everything works around private property and you have to sell the state’s property into private ownership to make it work. We don’t do that. We chose a steadier track and we address issues as they arise. When we get a problem we deal with it. We either allocate more state funds to fix it or use our citizens’ funds, or privatize assets. We don’t privatize everything. And some are unhappy about that. We are a welfare state with a strong social policy. We offer free healthcare to our citizens. We offer free education, and we now have twice as many students as we had in Soviet times. We also offer some programs students can pay for. But I keep all private schools under very strict control. We have developed requirements they should comply with and we closed down all schools that failed to meet them. We now have about five private higher education institutions and they all are up to international standards. And I’m sure some don’t like this either – that I set quality as a top priority in my state. Quality is key. As Deng Xiaoping said, a cat’s color matters not, as long as the cat catches the mice. That’s exactly my approach. Thus, the social and economic policies I pursue are very different from what the West would want us to have. Next. We do have a rigorous law enforcement system that wouldn’t allow things like a fist fight in parliament. We do have the majority election system. Some would prefer us to have the party list voting. But we don’t. When power is divided between entities, like the parliament and the government, the President ends up with no power, and it’s easy then to manipulate what happens in the state, you can stage fights and conflicts. This will backfire on the people. And behind all this you can lay your hands on some valuable assets through privatizing before anyone knows. And so they don’t like it that they can’t do it. As for freedom of speech, pluralism and other such things, that can’t be serious. How is it even possible not to have them with all the modern media around us? There’s no way, for instance, that Russia Today is a channel I have any influence on. If you like it, you can watch it – anyone can. And it happens a lot that, say, I give an interview to a Western media outlet, the interview goes fine, the journalist seems to have an understanding, we have a normal dialogue, but when it comes out they have thrown such dirt into it you can’t believe your own eyes. Trying to gag anyone doesn’t work these days. It’s only going to make things worse. It’s not worth the effort. And I am a completely different kind of person. I have never gagged anyone. I am open to discussion. Let’s talk. Only no throwing dirt at each other from behind a barricade. If they choose to throw dirt at me, I can’t respond, I have no right to, that’s one thing, and the other thing is that if I do I’ll only make that person famous. So I have to put up with it and I no longer respond to all the dirt-throwing like I did 10 to 15 years ago when I felt compelled to respond to everyone. Today I know that people can see for themselves what kind of person I am and what kind of people they are, and they can see what I can and cannot do. So I believe there’s plenty of pluralism. You surely know yourself how hard the Russian mass media has been and still often is on me, right? Of course you do! And there is also the Internet. Our analysts have calculated that 51% of our active population are active Internet users. It’s 51% - how can I possibly keep their mouths shut? It’s utter nonsense. I understand it very well and I have no intention of building a system that is going to cost me too much and bring no results. There’s plenty of pluralism in Belarus. I am quite agile, I have a clear mind and I see and analyze things. And I see no need to repeat someone’s silly words. I am, more than anyone, opposed to bans, building fences and other such things. You can win the fight if you stay strong. If you are weak you better stay out of the fight because you’re only going to get yourself and your state chased into a corner. I don’t want to sound like I’m being overconfident but I just want to say again: I feel strong enough to fight and stand up to any attacks on me, my family, and my state, my Belarus. RT:Speaking of which, two years ago you said that Germany and Poland had conspired against Belarus. What conspiracy did you mean? Who was behind it? RT:It was when the minister took your comment on his sexual orientation quite hard. AL: Right. On his being gay. But why take it hard!?! – if that’s what you are! RT:Did you know he was gay when you gave the interview? AL: No, I didn’t, I had no idea at the time. My staff included it in the memo but I didn’t finish reading it. RT:Then why did you bring it up? AL: I didn’t, they did. Sikorsky did, and I simply responded. He kept asking questions like “Moscow mayor Luzhkov banned the gay pride parade, would you ban it if your people wanted one?” I replied, “You know I probably wouldn’t. I probably wouldn’t let them do it downtown, I’d have them parade somewhere on the outskirts, let other people watch, maybe say something. I basically don’t mind the lesbians. But I definitely do mind the gays. RT:And what did they say to that? AL: They didn’t say anything. They just listened. I didn’t even see the look on their faces. The scandal broke out after they left. My foreign minister told me right after, “ Mr. Lukashenko, you would have done better not to talk about it.” “And why is that?” - I asked, and he said, “because he’s one of them,” and I said “why didn’t you tell me earlier?” And he said, “I sent you a memo,” and I just never finished reading it. RT:Did that ruin the relationship? Poured oil on fire? AL: I don’t know honestly. There was probably something to it, too. But that’s not what matters. I don’t think our relationship would have been better had I not called him gay. The media presented it out of context and thus it started to look like that. As I explained afterwards, they had previously approached me with basically a list of terms and conditions of the kind “we’ll be friends with you if you do this, and that, and that, and that. And I responded, “I can do this, and this, and that.” I did most of the things they had required, and that’s exactly what I call them – “their requirements.” But they did nothing in return! They simply found an excuse to talk themselves out of it, the excuse being that incident when we dispersed that crowd of 400 people who tried to break into the government building. There were a total of 800 people, 400 ran away, and the other 400 stayed and tried to take out the entrance doors. This was broadcast live. How would any other country respond to that? We didn’t do anything like pour water on them on this cold day, December 19th. We didn’t use tear gas. We didn’t shell them or shoot rubber bullets at them, as they do in EU countries. We simply took measures to protect our government building. And they used it as an excuse to talk themselves out of keeping the promises they had given me. That’s what it was about, and nothing else. RT:You mentioned a few times at the start that “you were previously called Europe’s last dictator.” I looked up and listened through a lot of material to get ready for this interview, and I can say that indeed 99% of the material I went through had the words “Europe’s last dictator” in them. And if I understand it right, you used it to refer to yourself ironically. AL: Exactly! I can tell you how I did it. I am to be interviewed by a Western journalist and all that person knows about me is what you just mentioned, all these things that are published. That Lukashenko is a dictator, and even though he probably doesn’t eat people alive, he definitely eats women. So here they come for the interview, sit quietly opposite me, and mention in passing the dictatorship thing, sort of low-key…But what I always did was bring it up and talk openly about it. I would tell them, alright, I am being referred to as a dictator. I have quite an autocratic leadership style which is defined by the system. Have you ever given it a thought why I chose this style and built this kind of system? Wouldn’t you think that there probably were some good reasons for that – because I came to power from the people. I didn’t come out of nowhere. I was involved in everything people do, in different kinds of work. And here I am now with this type of policy-making in place.… Could you perhaps try and see a good solid reason behind it? You see, no one has ever tried to look at this this way, no one tried to understand why this very particular person has built such a strong autocratic system, which at the very least yields results, by the way. So as for dictatorship, I say to them, you’re very lucky to meet Europe’s last dictator – alive, in person, remember it as that’s something you probably won’t see again. That’s the kind of irony I used. RT:But honestly, doesn’t it hurt you, do you not care at all about what the West, the US and Europe have to say about you? RT:Because that’s not just about you. It inevitably affects the country’s image. AL: Right you are, and you just said correctly – if it were only about me, I would probably get hurt and say “Ah, to hell with them.” But the thing is through that, they are trying to hurt the entire nation, the state. So I can’t say I don’t care at all. Although I should say I am not taking it too much to heart anymore when they say "dictator, dictator..." First of all there's less talk like that now, and secondly, even when they say this about me I know that there are a huge number of people, including journalists, who simply laugh at it. 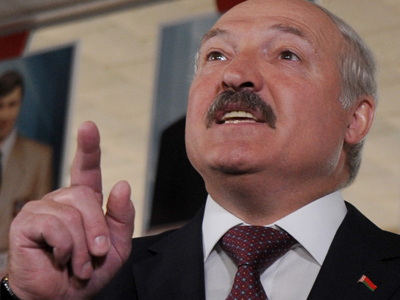 They say, "We’ve seen it for ourselves, Lukashenko is nothing like a dictator." So those who choose to say it are actually causing more trouble than it's worth. It rather hurts them, not me. Therefore I take it easier now when I hear these things. Of course, somewhere deep inside it stirs my feelings - though that's not because they say it about me, but because I feel sorry for those who actually believe it when they say it, as they don't even know that they are deluded about the reality and the person they're talking about. That's the only thing I feel bad about. RT:What happened to Lord Bell whom you previously hired to help improve the image of Belarus with the international community? AL: It's not the way it's being presented. I won't go into all the details about Lord Bell. He was recommended... by the way I am adamantly against the idea although many do it, they try to improve the image with the help of PR people, so it was the first and only time I agreed to meet the person who does some kind of work writing things, and I never even went into details as to what exactly he does. Besides, we never paid him, and he never charged us. All he said was that he wanted to talk and write something. As to the word that got out that it had to do with image promotion that probably came from him or someone else, and it was then misrepresented as if President Lukashenko had invited him to help push the country onto the right development track and fix the image. RT:So he was making a hard sell? RT:You know what else they said about that story with Lord Bell? That he was introduced to you by Berezovsky. Is that true? AL: No, Berezovsky didn't introduce us, Lord Bell arrived on his own, but it is true that Berezovsky was among those people who recommended him. So there's a bit of truth in it. RT:Is anyone working on your image now? AL: The fact that you got an interview with a "dictator" and are talking in confidence with him helps to build your image – and mine, too. The way to build an image is to do it patiently and steadily over a long time. And you know what happens… Let's look at Hugo Chavez. What image did he have? The same as Lukashenko. Or maybe we should say my image was like his, I've been in politics a bit longer, although we are about the same age, he is only two months my senior. They said all sorts of things about him, but when he died you saw what validation he got. And that was the real validation. Therefore I look at it this way - maybe when I die I'll get an objective validation, too. That's a joke, of course. But the fact is that what they say and think are often two different things. You are not always completely free and independent. RT:A few days ago, the Director of National Intelligence presented a report forecasting a possible new crisis for Belarus in 2013. Would you agree with this assessment? AL: Why not say the same about America? I would put it this way: the global community, including Belarus, may face a new financial crisis if it comes from its usual place of origin, i.e. the United States. The fact remains that Europe has failed financially, that's true, and since Europe accounts for half of our export turnover it's obvious that it’s going to affect our economy. Our export turnover with Russia is also declining a little bit although there's no crisis as such in Russia yet, but the thing is the crisis has affected all the markets, and since Russia, as well as some other countries are accountable for the second half of our export turnover that affects us, too. We already feel it, but we're still afloat. So that's no big news. Even in Russia, they're talking about it, and the authorities are reporting that the budget for the opening months of the year isn't coming out the way they intended. That doesn't mean that Russia is going to run into trouble. It's got ample resources including both the Reserve Fund and the National Wealth Fund, yet nonetheless it's facing the problem, too. And so it's true even more so for Georgia, Belarus, Ukraine and other states with the kind of real sectors of economy they have, with no oil and gas of their own and the need to pay high prices for them. Of course it's a problem for us when the entire world's economy is going down. But we have some reserves of our own and we'll use them if the need arises. We'll make it. RT:It’s just that during the latest crisis you resorted to requesting aid from the IMF. For instance, Chavez severed all ties with the IMF, the World Bank. AL: And that was the right thing to do. He had enough resources. He had the world’s biggest oil deposits, ample natural resources. He had all the reserves he needed – why take loans and pay off interest? RT:But he did request aid – from China. AL: He did ask China. Maybe he did it for ideological reasons. And China offered to help, but obviously for a profit. China is probably Venezuela’s number one investor, and they invest in the sectors of economy they’re interested in, such as gold and oil. RT:So asking the IMF was your last choice and you just couldn’t help it? And that’s because they’re imposing some political terms on Belarus you do not welcome? AL: That’s correct. Although that wasn’t about the political terms, it was about the tough economic terms they gave us – but we managed to comply. And overall, they were right to do it. Of course it was tough on us, but they in fact required us to implement the same measures we actually had to take anyway and had already started implementing. When you run out of money, what sense does it make to increase spending on welfare and benefits, to keep inefficient businesses running, and so on and so forth? But their approach was to just cut it all down. Ours was that it’s about the people involved and that we can’t do it to them so abruptly. So basically what they required was the same as what we did anyway, the only difference was they wanted us to do it “right away” while we were taking a steady approach. And by the way, the US supported our application for the loans, without their involvement the IMF wouldn’t have given approval. We successfully delivered on all the requirements and are now paying off the debt. And we took the cheapest loans possible, so I cannot really tell you anything else about it. Chavez probably refused to take loans because he had plenty of resources at hand and he probably also got loans in exchange for some future profits and benefits he could offer. RT:Thank you very much for the interview, Sir. AL: Please don’t call me Sir. I am no lord. It takes too much money to become one. 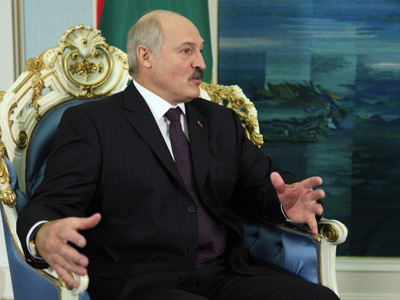 RT:Mr. Lukashenko, thank you very much for the interview. AL: My thanks to you for coming over to have a talk. We had a very useful talk, and it was fun, too – a nice way to pass time with all the bad weather, and so much more fun than going through government papers.